Feminine Gift Wrap can be used for birthdays, graduations, anniversaries and more. These are the perfect wrapping paper for her. Choose from over 100 patterns. 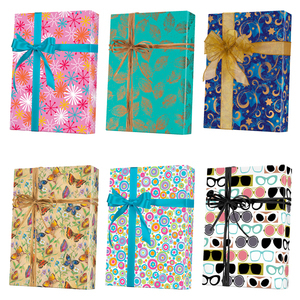 Feminine Gift Wrap includes silvers, golds, colored and more! Many sizes available, full ream, ½ ream, cutter box and jeweler's rolls. You will find giftwrap from Jillson Roberts, Shamrock and Sullivan.